Remember the preserved lemon relish I posted? Many of you sent me messages that you preserved a jar of lemons so those should be about ready to eat! Here are a few of my adventures with the simple preserved lemons that are easy to assemble: sauteed kale and chard with two tablespoons of the salted juice and one section of sliced preserved lemon; salad dressings using both the juice and the lemon; veggie pita sandwich with feta and sliced lemon; a Moroccan vegetable tagine with green olives and lemon; and a lemon saffron rice. The possibilities are endless and I really do not anticipate my stash of preserved lemons lasting through to next season. 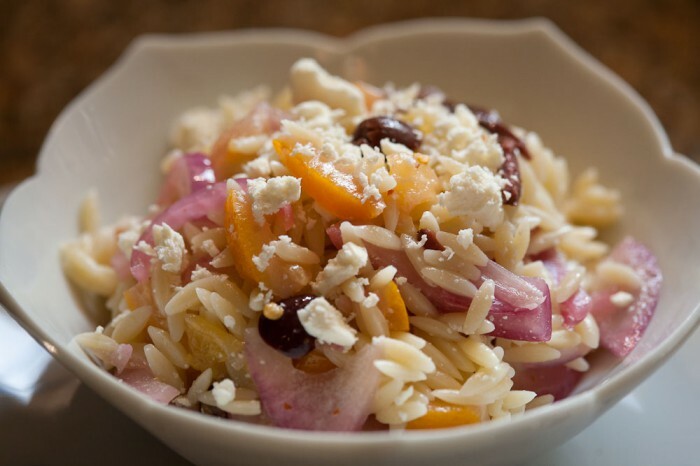 All of this fun started with the preserved lemon relish recipe from Jenna and her inspiration to make Selland’s Market style orzo pasta salad. You may have noticed that preserved lemons are a total Game Changer. This orzo pasta salad is a completely different animal than the typical summer pasta salad. Once you have marinated the “relish”, the salt both softens the bite and intensifies the naturally sweet flavour of the onion. Blending smoothly into the olives, the lemon infuses the oils with added freshness of citrus. Orzo pasta, although I rarely allow myself this simple carbohydrate, is the perfect delivery food distributing the ingredients and satisfying my need for pasta. Once the relish is made there are very few steps to take. For a nearly fat-free version, just toss the relish and spinach into the pasta to explore what plant-based explosive flavours can be achieved with minimal fats. PS- If you haven’t seen the ads yet, we are sponsoring the Tasting Competition at the Sac VegFest this year. There will be vendors from all the vegetarian and vegan venues in town, in addition to healthy living related products and services. We will also have a table, come by and see us!